Brent is an Ojibwe-Anishinaabe and a member of the Caribou Clan. He currently resides in London, Ontario but he is originally from M’Chigeeng First Nation on Manitoulin Island. In 2009, Brent began as an Assistant Professor in the Faculty of Education at Western University. He recently entered in to the administrative roles of Director of Aboriginal Education and Lead coordinator on the Master’s of Professional Education program with a focus on Aboriginal Educational Leadership at Western. He is also an Associate Editor on the International Indigenous Policy Journal. Brent is a co-investigator with Dr. Rebecca Coulter, Dr. Jason Brown, and Bruce Stonefish on a major Social Science and Humanities Research Council (SSHRC) grant that involves collaboration with the Indigenous Education Coalition in London, ON. The SSHRC research is focused on educational assessment from First Nations perspectives. 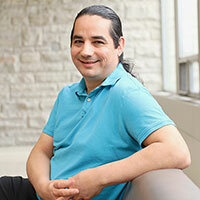 Brent is also an Associate Researcher on the Indigenous Health and Well-being Initiative (IHWI) at Western. IHWI’s focus is on bringing together Faculty members and graduate students from across the university to make a vital investment in Indigenous research and teaching at Western. As an Anishinaabe inni and Indigenous faculty member, Brent is guided by his learning in Anishinaabe traditional knowledge environments and by the research and scholarship in the areas of Indigenous Knowledge, Indigenous research methodologies, and Aboriginal Education. Collectively, these sources of knowledge provide the foundation for a decolonizing and critically engaged approach used in his teaching and research.